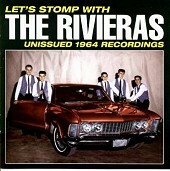 The Rivieras' covers of classics such as "Arizona Sun" (a take on "California Sun"), Buddy Holly's "I'm Looking For Someone To Love" and "Peggy Sue", Chuck Berry's "Johnny B. Goode", and several others make this twenty-two track album recorded in 1964 an amazing garage rock collection of hit after hit. Wild, yet contained, The Rivieras embodied rock 'n' roll to a tee. Here the classics like they've never been heard before. I'll give this an A.